Most of us would agree. Innovation is vital to any business or organization for delivering superior value to customers and establishing or maintaining a lead over the competition. How do you build an innovative company? In this article I will cover seven tried and tested rules that address that question. Set a clear and compelling target. A shared ambitious goal focusses an organizations and fuels people’s creative energy. A good BHAG (Big Hairy Audaciaus Goal) lays out the long term strategic agenda (read more on BHAG’s). A well known example would be Apple’s BHAG: “To democratize technology by providing products everyone will want to use.” It’s important to remember that a BHAG doesn’t tell us HOW to innovate, it tells us WHY we innovate. If anything innovation should align with strategy. Once a BHAG is formulated a number of (usually three to five) drivers of the innovation agenda can be identified. Here is an example. Pelliano is a small fast growing gentlemen’s fashion brand I work for. They sell gentlemen’s clothing. Their innovation agenda is driven by their desire to stage excellent customer experiences and their need to minimize the costs of keeping stock. These two drivers are criteria by which they measure new ideas. Clarity about these drivers and consistent adherence to them (i.e. ‘kill you darlings’) will help employees and management alike to focus on those proposals that are most likely to push the organization measurably ahead towards it’s BHAG. You will find that innovation drivers are often interrelated and interdependent. For example increasing the sustainability performance may also lead to a better perceived quality or lower cost of use. Not every proposed innovation is likely to contribute in equal measure to the overall strategy. An organization hould focus its energy on the right innovation proposals: those that are most likely to yield the best results. Working on too many ideas at a time will only bog down the organization. You need to weed out less viable proposals at a relatively early stage of their development. When in doubt, look at rule number 2. Does a proposal drive the innovation agenda. Innovation is too important to be delegated. Innovation requires a coordinated and dedicated effort to shift important resources towards experiments that yield possible future gains. Without high-level support innovation stands little chance of surving the day to day routine or company politics. The CEO, the board and top management need to give frequent and visible support to innovation projects within the company. This includes the allocation and protection of time, funding and other resources. The right leadership requires patience too and a long term view on innovation, avoiding frequent short-term adjustments. Ideas and opinions should be shared freely AND actively sollicited from all sources within the organization and ideally outside of it. Honesty, tolerance (of other opinions) and transparency help establish a culture of trust and mutual understanding. Assign the development of the idea to the person who proposed them. Reward them for it. Promote people’s curiosity and afford them the opportunity to walk less conventional routes. celebrate innovative successes within the organization and outside it. Leadership must establish and maintain a culture of innovation by rewarding the right behaviour and eliminating the wrong behaviour. As with all things cultural it is very important that top managment leads by example. A think a great example of this would be Theo Rinsema (Microsoft’s office-less CEO in the Netherlands). 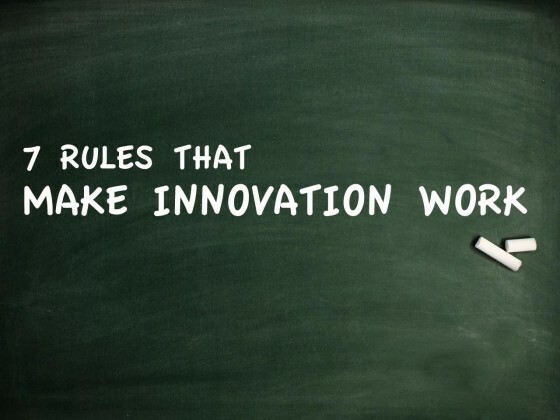 You can and you must be systematic about innovation. Though creativity may seem (and sometimes really is) a somewhat chaotic process, innovation benifits greatly from clear processes and a good innovation system. This requires setting the right priorities, and establishing the right rhythm in your organization as well as making progress measurable and people accountable. Make innovation part of the (bi-) weekly team meetings. Set metrics for top and middle management in accordance with you innovation goals. Make progress part of quarterly and yearly strategy meetings. In the end innovation is an idea turned into reality. Too many great ideas die a beautiful death on paper without ever having been tested in real life. One of greatest barriers for ideas to be launched – to be executed – is NOT people’s unwillingness to launch great ideas, it’s people desire to launch ONLY great ideas. By this I mean that people tend to want perfect their product of service on paper before they test the water. There’s only one cure for this. I hope you found this article useful. If you have any feedback or insights to share. Please do so in the comments. Good one. A sharp look at innovation. Thanks for your visit and thanks for your nice compliment. 🙂 What a nice way for me to start the week.